Hooked on Needles: Fall 2011 ~ 800th Post Celebration! This giveaway is now closed. Click HERE to see who the lucky winner is. Thanks to all who entered! Just a little collection of goodies that you might enjoy having, with a fall-ish sort of theme. 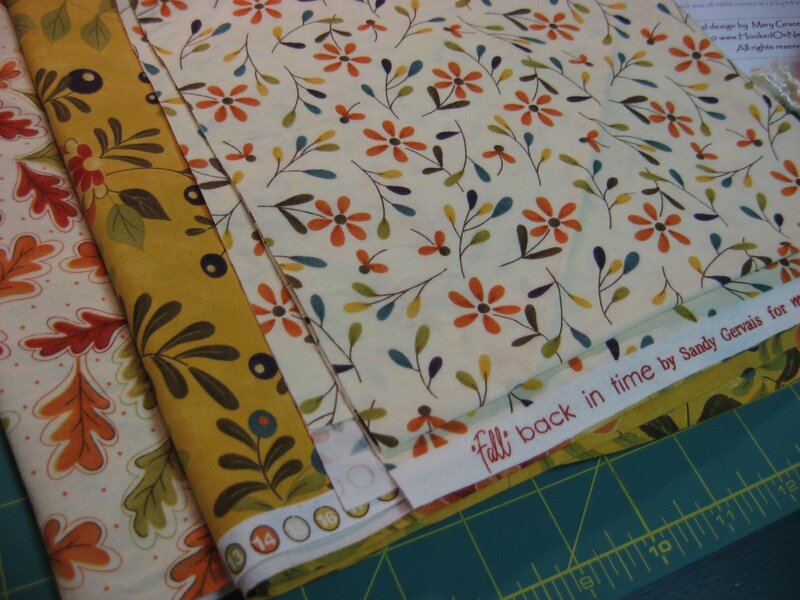 Three half-yard cuts of lovely fall fabric from a line called Fall Back In Time by one of my very favorite fabric designers, Sandy Gervais. She designs for Moda and I love every one of her fabrics! 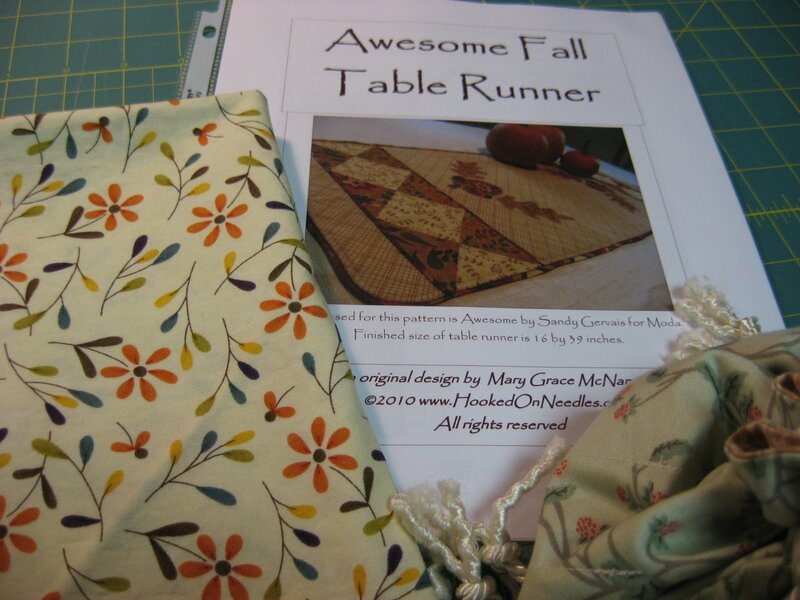 A printed copy of my very own Awesome Fall Table Runner pattern so you can make an awesome table runner to dress up your Thanksgiving table. But if you don't win and still want to make one, you can purchase the PDF version of the pattern over there in my Etsy shop for only $5.00 and have it on your computer within 24 hours, but usually sooner! 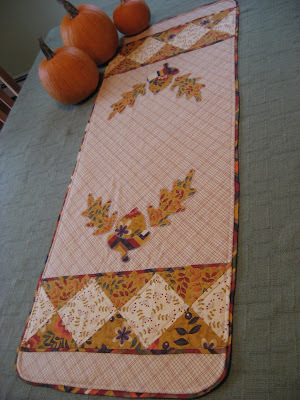 There is also one finished table runner for sale there too, so if you want one and don't want to make it, grab it quick! 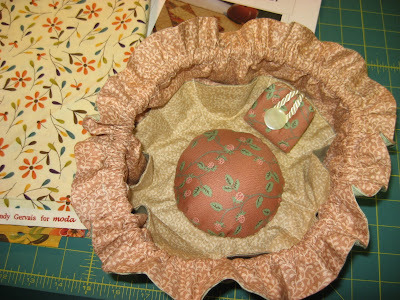 And this lovely little sewing pouch with a pin cushion and little pockets built right into the inside of it. It also comes with a little matching needle book to keep your needles safe. 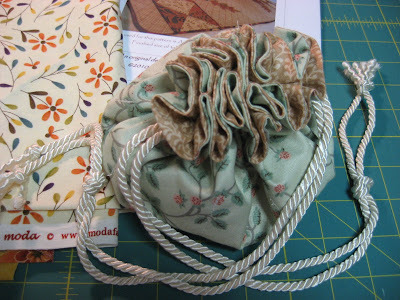 Doesn't it remind you of an old fashioned fancy little purse? I think it would be a very elegant way to carry your sewing supplies! So that's what I'm offering for this little celebration giveaway, and whatever else I decide to include before I close up the package and mail it off to the lucky winner. 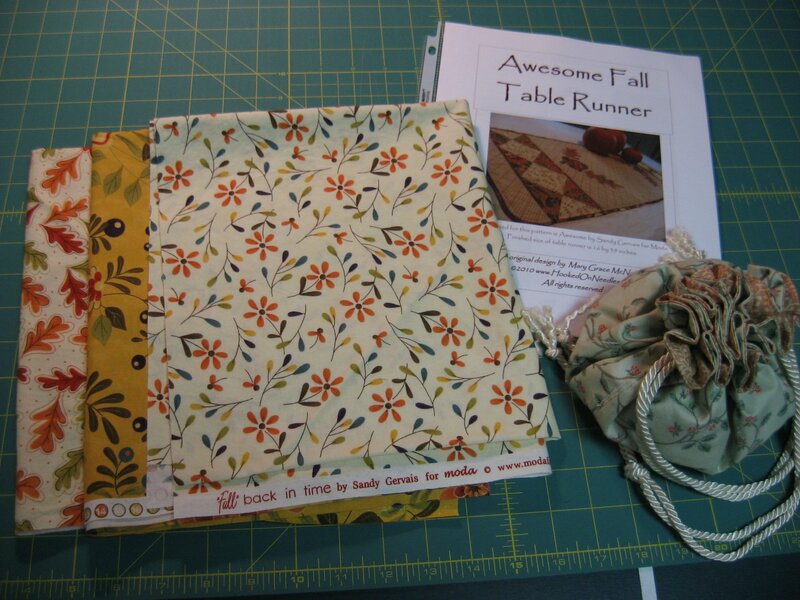 Here's what you have to do to win: Just hop on over to my Etsy shop and add it to your favorites. Or stop in and visit my Facebook page and "Like" it. Then come back here and leave a separate comment for each one you do so you can get credit for each one. I'll check, so if your name on Etsy or Facebook is different than your profile, please let me know in your comment. I will announce the winner on my 800th post which should be coming up in the next week or so, and I will email the winner, so make sure your email address is available too. 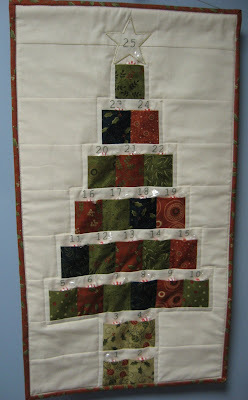 And don't forget to stop in over at The Girl Creative and enter to win a $25 shopping spree in my Etsy shop! Liked you on Facebook ~ Dawn Hayes Meador is my FB page! Your esty shop is my favorite! Thanks for the giveaway and congrats on your 800th post! I shop is definitely one of my Etsy favorites. I favorited your Etsy shop. I love your shop. I liked you on Facebook. Love your blog. Already like you on facebook, and now also have ur etsy in my favourites.Thanx for the giveaway. Emin Bozdag on fb. I like you on Facebook! Your work looks awesome! I am sorry I missed your give a way. I wasn't home to get your blog. I just want to say I love your bag sewing pin cushion. Is there a pattern to be purchased? I could be interested. I added your Etsy shop as my favorite. I even joined Etsy...I've been wanting to do this for a long time anyway so this just prompted me to do it. Thanks so much. Congrats on the 800 posts! Happy Holidays. Liked your FB page. I also like your table runner pattern.